Just about anyone who knows even a bit about the Cthulhu mythos knows of the legendary sunken city of R'lyeh. It was lost below the waves of the Atlantic long, long ago. But the city has risen once more and the investigators have made their way there. But is going there at the seeming behest of an ancient artifact the best idea? The strange force that pulses in the broken amulet has grown stronger since arriving on the outskirts of where it had first been assembled. When the investigators advance to the second stage of the R’lyeh Rising mode, the scenario card is flipped from the Dark Waters track to the Amulet of R’lyeh track. The amulet’s surge in power can both help and hinder the beleaguered investigators as they face a power completely beyond their comprehension. When the omen token would advance, a member of the Deep One Legion is repelled by the amulet’s power, removing it from the game. 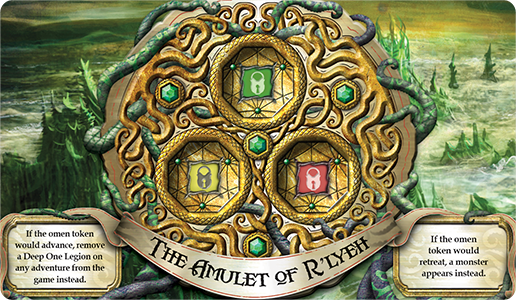 If the omen token would retreat, then the amulet calls out to the city’s inhabitants, and a monster appears. 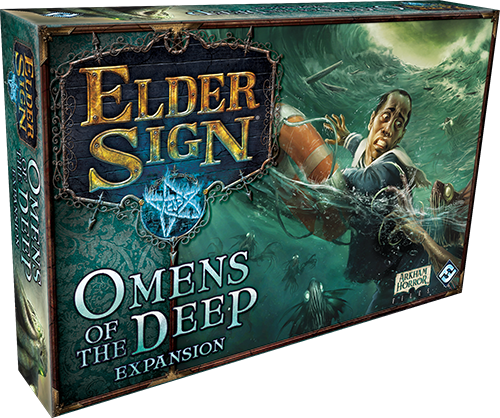 Savvy investigators will quickly learn to choose their adventures wisely, wielding the amulet with skill to keep the Deep One Legion at bay.